Like 'Bully', 'Too Bad, So Sad' is another card game created and developed by James Griffing and Rebecca Bowman. Please also visit their other websites. Enjoy! 'Too Bad, So Sad' is a fun and easy-to-learn card game for two or more players. 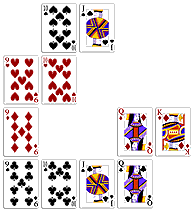 It is played with a standard deck of cards with either 2 or 4 Jokers (wild cards). Players take turns sequentially placing cards in a continuum grid until a player (winner) has no remaining cards. Each player views their own hand and keeps it hidden from the other players. The remaining deck (a.k.a. 'Sad Pile') is placed face down off to the side of the playing table, yet within arms reach from all players. The first card from the top of the deck is turn over as the 'starting card' and placed face up between all players. Since most the cards will eventually be placed on the table in sequence, a low card is placed toward one end of the table, whereas a high card is placed toward the opposite end of the table. If a joker is turned over as the 'starting card', it is immediately tucked face down somewhere near the middle of the 'Sad Pile'. Another card is then taken from the top and used as the 'starting card'. The player to the left of the dealer begins play. The play continues clockwise with each player taking turns until a first player has placed their last remaining card. During each turn, a player may either place one playable card next to a card on the table or take a card from the 'Sad Pile'. If a player can not set a playable card next to a card on the table, the player must draw a card from the top of the 'Sad Pile'. If a playable card is drawn from the 'Sad Pile' the player may play that card before their turn is over. If a playable card is discovered after the next player has begun their turn, the player must wait to play the card during their next turn. If a player with one remaining card in their hand is forced to draw a card from the 'Sad Pile', the other player(s) may lament, "Too bad, so sad!" in unison. The player who has no remaining cards in their hand is the winner. The remaining players may play for runner-up positions. Continue to Part 2 (Playable Cards).